FOR IMMEDIATE RELEASE — For the first time on Live From Lincoln Center, the curtain will be drawn back on one of the world’s premier ballet academies – the School of American Ballet – with the presentation of the School’s 50th Annual Workshop Performance. Taped during a live event in May 2014, this coming broadcast will feature performances and rare behind-the-scenes footage, demonstrating the legacy and continuing tradition of the excellence fostered at this prestigious academy and showcasing the talented dancers of the future. Live From Lincoln Center’s 40th anniversary season presentation of the “Curtain Up: The School of American Ballet Workshop Performances” will air on Friday, December 12, 2014 at 9:00 p.m. on PBS (*check local listings), hosted by Audra McDonald. This past Spring, the 50th Annual Workshop featured a program specially chosen to recognize the School’s co-founder George Balanchine and former faculty member Alexandra Danilova, who together launched SAB’s first year-end student showcase in 1965. 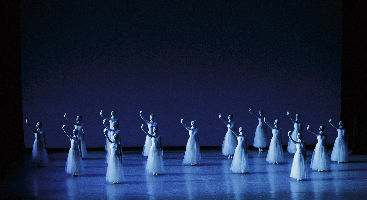 The all-Balanchine program, which was presented at Lincoln Center’s Peter Jay Sharp Theater, included the seminal Serenade as well as excerpts from such famous works as Coppélia, Swan Lake, and Western Symphony. These excerpts were taught by some of the world’s most-acclaimed instructors and foremost stagers of Balanchine’s work, including Peter Martins and Darci Kistler, who also appear in this broadcast, talking about the school and its history, the works, and the dancers to be featured. This broadcast represents the first-ever School of American Ballet presentation on Live From Lincoln Center. The School of American Ballet (SAB), the official training academy of the New York City Ballet, was founded by Lincoln Kirstein and legendary choreographer George Balanchine in 1934 as the first and most essential step in their mission to establish a uniquely American classical ballet company. Since its founding, SAB has elevated the quality of American dance and is today the premier ballet academy in the United States, training more students who go on to become professional dancers than any other institution. 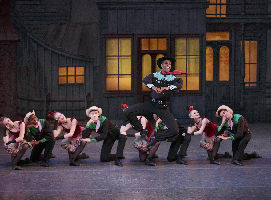 At the end of each school year, advanced students are selected to perform in the School’s Spring Workshop, which is presented in this broadcast, providing audiences a unique opportunity to witness the pre-professional debuts of the nation’s most talented ballet students as they prepare to embark on professional ballet careers with notable companies in the U.S. and abroad. PBS, with over 350 member stations, offers all Americans the opportunity to explore new ideas and new worlds through television and online content. Each month, PBS reaches nearly 109 million people through television and over 28 million people online, inviting them to experience the worlds of science, history, nature and public affairs; to hear diverse viewpoints; and to take front row seats to world-class drama and performances. PBS’s broad array of programs has been consistently honored by the industry’s most coveted award competitions. Teachers of children from pre-K through 12th grade turn to PBS for digital content and services that help bring classroom lessons to life. PBS’s premier children’s TV programming and its website, pbskids.org, are parents’ and teachers’ most trusted partners in inspiring and nurturing curiosity and love of learning in children. More information about PBS is available at www.pbs.org, one of the leading dot-org websites on the Internet, or by following PBS on Twitter, Facebook or through our apps for mobile devices. Specific program information and updates for press are available at pbs.org/pressroom or by following PBS PressRoom on Twitter. In addition to underwriting from MetLife, the series is also made possible with generous support from the Robert Wood Johnson 1962 Charitable Trust, Thomas H. Lee and Ann Tenenbaum, The Robert and Renée Belfer Family Foundation and the National Endowment for the Arts. SAB 2014 Workshop Performances "Western Symphony"
Caption: Christopher Grant leading the ensemble in the Fourth Movement from Western Symphony at the School of American Ballet’s 2014 Workshop Performances.Photo by Paul Kolnik. Choreography by George Balanchine ©The George Balanchine Trust. 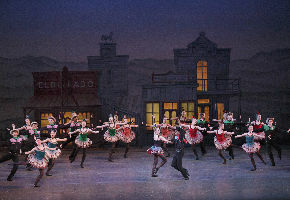 Caption: Clara Miller and Christopher Grant leading the ensemble in the Fourth Movement from "Western Symphony" at the School of American Ballet’s 2014 Workshop Performances.Photo by Paul Kolnik. Choreography by George Balanchine ©The George Balanchine Trust. SAB 2014 Workshop Performances "Swan Lake"
Caption: Alston Macgill and Joshua Shutkind leading the ensemble in excerpts from "Swan Lake" at the School of American Ballet’s 2014 Workshop Performances. Caption: Alston Macgill in excerpts from "Swan Lake" at the School of American Ballet’s 2014 Workshop Performances.Photo by Paul Kolnik. Choreography by George Balanchine ©The George Balanchine Trust. SAB 2014 Workshop Performances "Serenade"
Caption: Addie Tapp and the ensemble of "Serenade" at the School of American Ballet’s 2014 Workshop Performances. Photo by Paul Kolnik. Choreography by George Balanchine ©The George Balanchine Trust. Caption: "Serenade" at the School of American Ballet’s 2014 Workshop Performances. ?Photo by Paul Kolnik. Choreography by George Balanchine ©The George Balanchine Trust. Caption: Addie Tapp and Preston Chamblee in "Serenade" at the School of American Ballet’s 2014 Workshop Performances. Photo by Paul Kolnik. Choreography by George Balanchine ©The George Balanchine Trust. Caption: Peter Martins, Artistic Director; dancers Preston Chamblee and Addie Tapp; "Serenade" at the School of American Ballet’s 2014 Workshop Performances. Photo by Paul Kolnik. Choreography by George Balanchine ©The George Balanchine Trust.